The history of electrical current is replete with tragic incidences of maiming and death caused by ignorance and/or inattention to known danger. Having been involved in both the electrical wiring and the electronics fields since the 1970s, I am quite aware of the legion of hazards present when current flows. My tool box contains screwdrivers and lineman's pliers with notches of melted metal from inadvertent contact between differences of potential in circuit breaker panels and electrical wall boxes. Once you experience the thrill of a sudden blinding flash, unique buzzing sound, and smell of burning hot steel, you'll never forget it. Those incidences could have been avoided with more careful work practices. A lot of people have been electrocuted, though, through no fault of their own, if ignorance (as opposed to stupidity) is a valid excuse. Early radios, televisions, and other household appliances did not have a safety ground, and without a polarized plug, some even had lethal voltages connected to exposed metal parts depending on which way the plug was inserted into the wall socket. If you look inside the walls and ceilings of turn-of-the-last-century buildings that have not had upgraded electrical wiring, you will find knob and tubing wiring where exposed wiring was stretched tightly between stud-mounted insulators such that shorting out the conductor pair was very easy to do. Insulation, if any, was a thin layer of cloth mesh. Many an invading squirrel met its end by touching both conductors while running through an attic or crawling up a wall. I often cringe when seeing photos of early medical equipment with wires taped to patients and ungrounded, metal-framed instruments sitting at the bedside while plugged into the ungrounded, two-slot receptacles. This article addresses some of the research into how not to kill or cripple a patient with electricity in the process of trying to heal him. Many visitors to today's hospitals express some degree of surprise at how much electronic equipment is used by the medical profession in diagnosing illnesses and caring for patients. In spite of the popular medical TV shows with their science-fiction-like sets, the visitor is unprepared for the sights he will encounter in a really modern hospital. 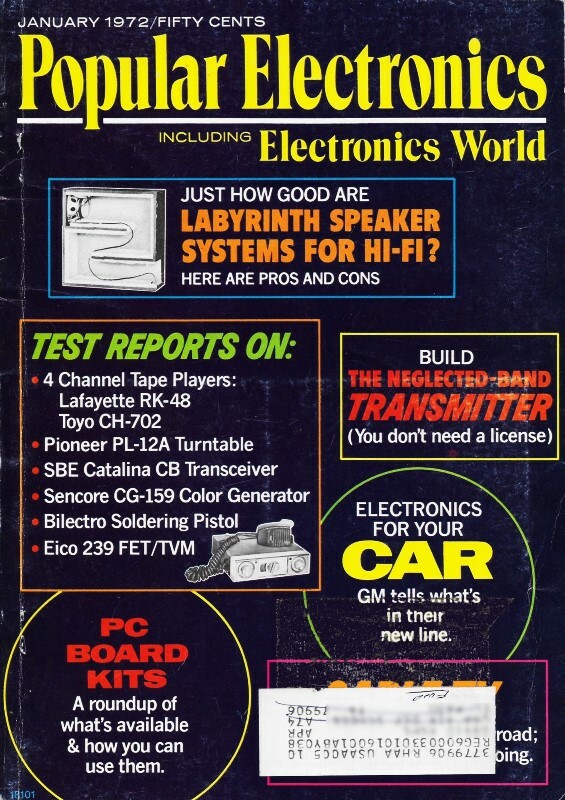 It is not uncommon to find patients all over the wards wired up to some type of electronic instrument - from oscilloscopes to voltmeters to recorders to computers. For some patients and visitors, seeing all this electronic gear in use conjures up thoughts of shock hazards. 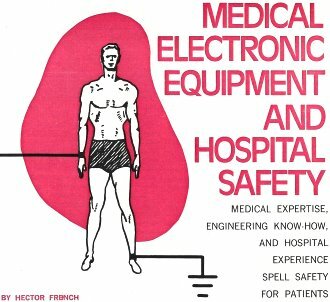 At one time, when electronics first invaded the precincts of medicine, there was a very real danger of shock hazard to the patient on whom the new equipment was used. But this is hardly the case now. For years, medical engineers and scientists have been working on electrical safety for the patient. They are designing electronic equipment that is hundreds of times safer than the so-called safe appliances you use every day at home. How much leakage? 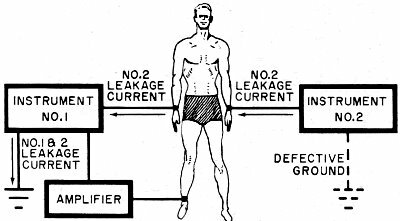 In medical electronic equipment used on patients, current leakage is extremely important. All electrical and electronic equipment has leakage current, and medical equipment is no exception. 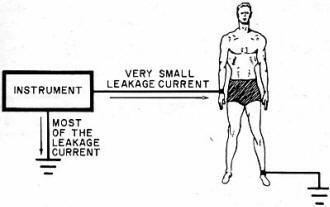 So, the first question the designers had to ask was: How much leakage current is too much? If the patient gets any sensation from the current it is too much. Considering that the minute he is connected to the equipment he begins to worry, you can imagine how much more worried the patient will be if he feels even the slightest tingle. Fig. 1 - Body must be grounded when connected to instrument to eliminate interference due to antenna effect. Fig. 2 - Grounding both patient and instrument is not as safe as expected. Fig. 3 - Ungrounding patient eliminates body current path, but antenna effect returns, making readings useless. Fig. 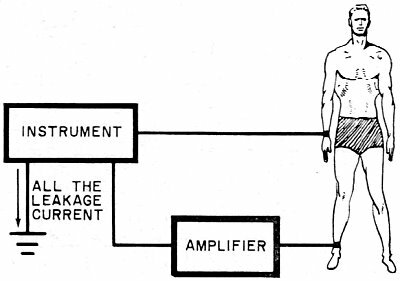 4 - Feedback amplifier places patient's body at ground potential without danger of physical connection. Fig. 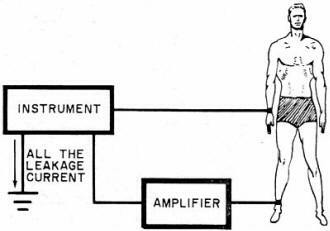 5 - Even with feedback amplifier, patient is in danger of shock when more than one instrument is used. Fig. 6 - Safest hookup is shown here. In addition to amplifier, current-limiting high-isolation inputs are used. One has only to look at the effects various current levels have on the human body. At 1 milliampere through the intact, unbroken skin, the patient will probably feel a very slight tingle. At 10 milliamperes, he will in all likelihood think someone is trying to electrocute him. 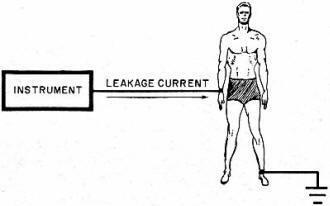 If the current is increased to 100 mA, then there is a good chance that the patient will actually be electrocuted. If the patient is in heart surgery, there is the possibility that the leakage current might flow directly to the ultra-sensitive heart tissue itself, where as little as a few hundred microamperes can be lethal. This tiny current is almost 1000 times smaller than a possible lethal dosage applied through the skin. The engineer who designs medical electronic equipment and the hospital personnel using it must guard against any instrument or combination of instruments that would allow the current through the patient's body to approach 100 microamperes. Grounding the Patient. Another problem is that of grounding the patient. Grounding is necessary because the patient's body acts like an antenna, picking up electrical interference that can completely mask the signals the doctor is looking for. Connecting the patient to ground stops the "antenna" effect. With the patient connected to a suitable ground and to some type of medical instrument as shown in Fig. 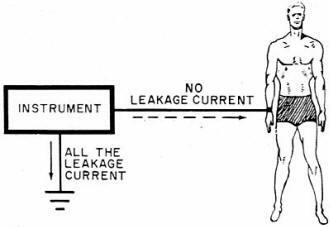 1, all of the leakage current from the instrument passes through the patient's body. This is an obviously unsafe situation. The answer would appear to be to ground the instrument as well as the patient as in Fig. 2. Now, most of the current flows harmlessly to ground, leaving only a very small amount to pass through the patient's body. But closer inspection reveals that this setup is not safe either. 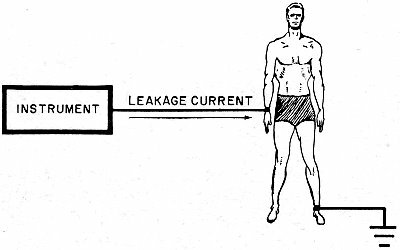 The circuit to ground through the patient's body is still there, carrying a small current. 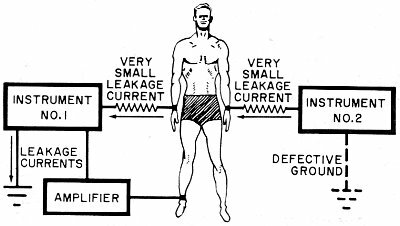 Ordinarily, this current would be too small for concern, but if the instrument's ground should become defective, the entire leakage current will pass right through the patient's body once again! 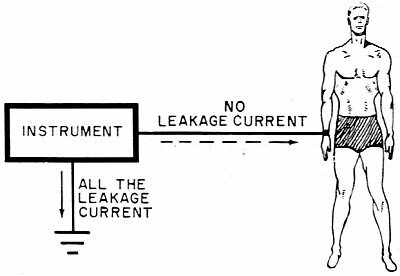 Another potential hazard is that the instrument connected to the patient can fail and pump many hundreds of times the ordinary leakage current to the patient. If the patient were in heart surgery at the time, only a few hundred microamperes could spell disaster. It is clear that grounding the patient and the instrument is not the answer for up-to-date hospital safety. What is needed is some method of operating the instrument without having to ground the patient at all as in Fig. 3. This arrangement eliminates the path to ground through the patient's body so that he would be completely protected against leakage from the instrument. A Better Way. There is one big drawback to the arrangement shown in Fig. 3. It will not work! Remember that if the patient is not grounded, his body acts like an antenna and picks up interference. To make this setup practical, the patient's body must be brought to ground potential without actually connecting him to ground. There is nothing tricky in this. As shown in Fig. 4, it is accomplished by adding a "bucking-out" feedback amplifier. Built right into the instrument, this amplifier adds just the right amount of voltage to bring the patient's body to ground potential without a physical connection to ground. In this manner, the instrument is prevented from sending any leakage current through the patient, and there is no interference from the antenna effect. For ultimate safety, however, even this system may not be enough. While the patient is protected well enough when there is only one instrument, two or more instruments (see Fig. 5) complicate matters enormously. The leakage current from instrument No. 2 still flows through the patient's body to ground. And while not grounding the patient with one instrument may be a solution, there is a greater possibility of failure with two or more instruments. Although the possibility of failure may be remote, if it can happen at all, a safety-oriented design must guard against it. High-Isolation Inputs. There is a solution, using "high-isolation" inputs, that provides state-of-the-art patient safety. Built into the medical electronic instruments, the isolation circuits are so effective that their action is measured in terms of the many megohms of isolating resistance that they appear to insert between the instruments and the patient. In many instruments, 30 megohms is a common value. 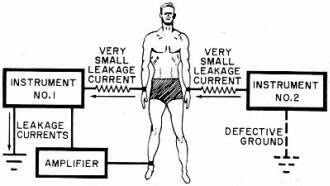 Even if the ground circuit is defective (see Fig. 6), this isolation protects the patient with any number of instruments connected. If, for example, instrument No. 2 should develop a defective ground, there will still be a leakage current through the patient, but the isolation is so great that the leakage current is limited to a wide margin of safety. It is so low, in fact, that even a number of such instruments being used at the same time during open-heart surgery will not provide cause for alarm. You might be wondering about the "human error" involved in the use of medical electronic equipment. This is understandable. But, again, there is little cause for alarm; hospital staff personnel are well trained in the handling and use of any equipment designed for diagnostic and/or patient monitoring purposes. The next time you are in a hospital, either as a visitor or as a patient, you can lay to rest any fears you might have with reference to shock hazard. Everything possible - medical expertise, engineering know-how, and hospital safety experience - are on the side of the patient.